You don't often realize just how immersive a story can be until you've had time to reflect on it. 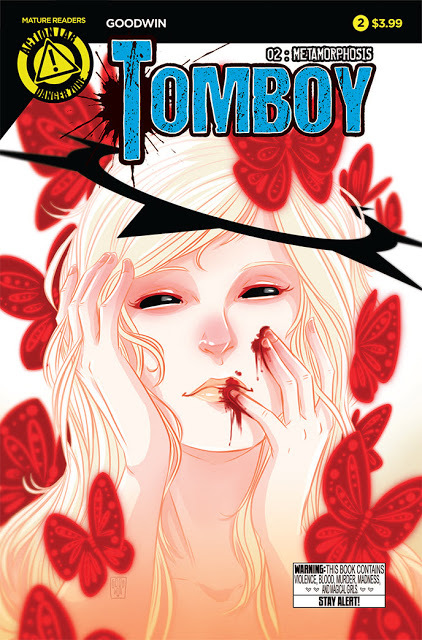 'Tomboy' #2 is that kind of story where it's paced so well that time evaporates before you know it but is so dense with details you need time to digest it all. Addison plays a small part of the second issue, still in shock after the events of the first issue, but there are plenty of moving pieces surrounding her. After Addison's bloody rampage on two dirty cops in issue one she arrives on her grandfather's doorstep and he's awfully understanding and accommodating. Perhaps a little too accommodating. A lot of the issue revolves around him and how he tries to eliminate any evidence of his granddaughter's magic-induced attack that left one cop dead and one badly hospitalized. Granpa knows things and he's enlisting the help of others. Meanwhile, the investigation of the grisly attack is making the news and for one detective that means keeping any connections to his boss nonexistent. What is he hiding? Why haven't we met the big boss yet? It's this type of intrigue Mia Goodwin injects in 'Tomboy' where no one is completely innocent of anything. Goodwin breeds an atmosphere of distrust and danger because there's something more devious at work with Addison trapped in the middle of all the chaos. However, she may be the only one capable of stopping whatever is going on. Besides Goodwin's great detailed pencil work her pacing through concise and efficient layouts really moves the story along. There isn't an ounce of fat in the script and the panels reflect that. There's a lot of information coming at you, but it never feels forced or clunky. 'Tomboy' #2 reveals the mystery is much deeper and widespread than previously thought. It's not clear if Addison's magic girl rage is real or her mind playing tricks, but her attack has brought other players out of the shadows. With great art and an evolving conspiracy, 'Tomboy' is becoming a more complex series than its debut alluded to.